You Already Own Gold, Now How Do You Get to It? Thinking of buying gold? You already do and it’s sitting in your pocket. On average, a cell phone consists of approximately .001 troy ounces of gold in its hardware. At today’s prices this amount totals about $1.23. Not much, but we’re only getting started. Your desktop computer has .0025 troy ounces of gold inside totaling a little more than $3. There’s even more gold - about $30 worth - hiding inside your laptop. Most modern cars include computers and airbag sensors requiring gold which adds to your total. It’s easy to see why demand for gold by the electronics industry has grown for eight consecutive quarters. In fact, in the latest quarter this demand equaled more than 85 tons. Manufacturers need more gold to build the hardware that keeps our economy running. Computer printed circuit boards and servers are among the biggest demand drivers. Manufacturers need more gold as consumers choose to ditch their old phone and buy a new one with superior memory capacity. It’s the old phone, however, that has people interested. The reason: experts in e-waste calculate that one ton of cell phones holds 80 times more gold than the average gold mine. Companies are awakening to the value of your forgotten phones and old laptops. This year Apple debuted Daisy, an assembly line that works in reverse to dismantles old iPhones. Academics have also turned their attention to the benefits of reclaiming precious metals from e-waste, a practice called “urban mining.” Researcher published in Environmental Science and Technology calculate that “ingots of pure copper and gold could be recovered from e-waste streams at costs that are comparable to those encountered in virgin mining of ores.” Moreover, their research was limited only to television sets. Expanding the analysis to include all other electronic devices would reveal even greater opportunities considering that the average family has about 80 electronic devices. Companies want this waste. Harvesting gold and other precious metals from e-waste is easier than sourcing a mine and digging. It’s also more environmentally sound. Recycling reduces the burden on our environment while diminishing the carbon output from mining efforts. Globally, we generate approximately 40 tons of e-waste every year. We recycle only 13 percent of that total. Gold is the invisible hand offering a solution. In other words, the presence of gold in these devices is exactly what’s propelling industries to collect and dismantle e-waste in an environmentally friendly way. Today, countries like South Korea are using urban mining to source rare earth metal from discarded batteries. As recently as 2016 experts in Korea yielded more than $18 billion worth of metals from electronics. This volume represents nearly one-quarter of the country’s demand. 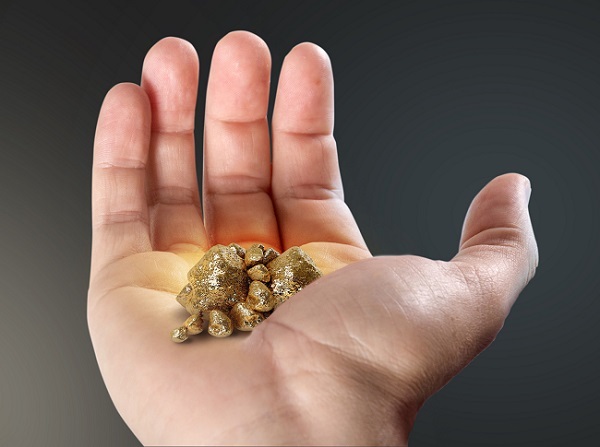 The future of gold resources is not in the ground, it’s in your hand.